California startup company, Plastc, Inc., has created a digital plastic card that is able to combine all of your payment methods into one. Plastc looks and feels like an ordinary credit card except it holds information on up to 20 different cards including credit cards, debit cards, loyalty and gift cards. Founded in January 2013, the Palo Alto California based company currently has a patent pending with the United States Patent & Trademark Office (USPTO) for its plastic card and is looking to start a crowdfunding campaign to raise funds. Plastc will initially partner with seven banks including American Express, Bank of America, Chase, Charles Schwab, Citi Bank, US Bank and Wells Fargo. 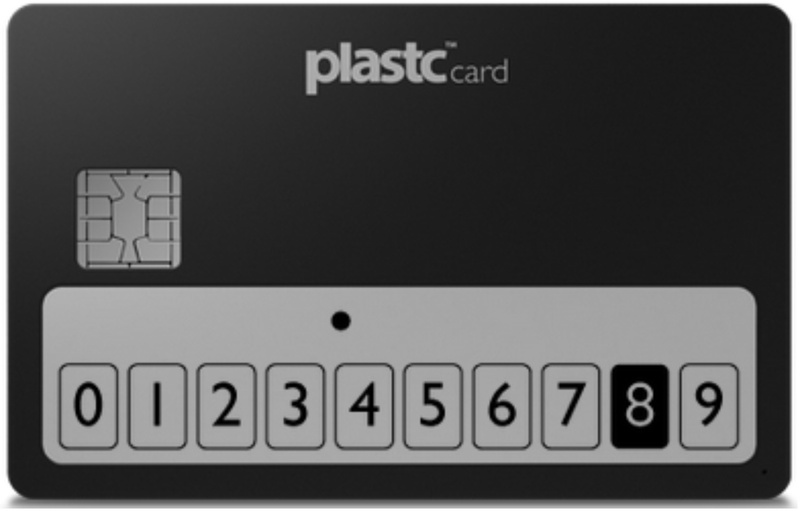 Plastc, a Fin Tech company, is a digital payment card with a magnetic strip and touchscreen E Ink display that works with every payment system that supports ordinary credit cards. The beauty of Plastc is that it stores all (up to 20) your current debit, credit access, loyalty and gift cards in one device. The touchscreen E Ink display screen along the bottom of the card displays users full credit card numbers and allows them to swipe through different cards, lock and activate each card with a PIN and generate barcodes. Plastc’s touchscreen display and innovative technology provides users with an all-in-one device. Once you choose which card you would like to use, you swipe it exactly like you would an ordinary card. The card has a 30-day battery life and can be wirelessly recharged. The company is also planning to launch a sister app called Plastc Wallet that syncs users smartphones with the card and allows them to monitor their purchases and track their card. 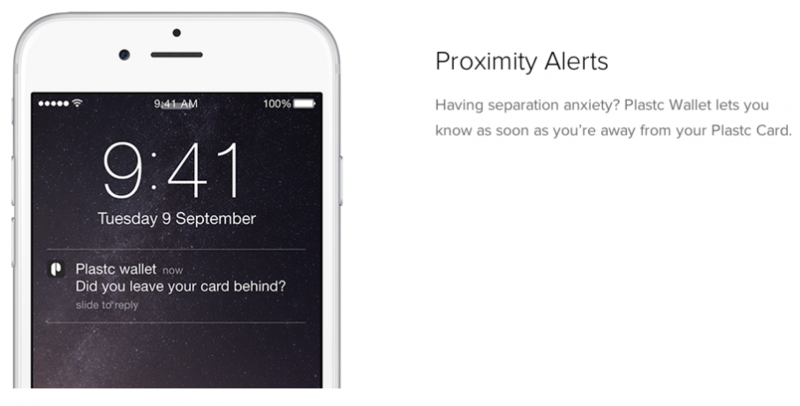 The application’s proximity alerts will alert you when you are too far or separated from your card. Or, if you lose your card, the application’s return me mode will lock it up and allow you to remotely wipe it clean. In addition, the app allows you to check your account balances and perform other tasks through your smartphone. For users concerned about security and privacy, the app requires users to input their pin number and facial recognition to access the data. Plastc is not the first of its kind to hit the market. Apple’s new Apple Pay, PayPal, Square and Plastc’s main competitor Coin are also in the business of providing unconventional alternatives to the credit card. Apply Pay‘s Near Field Communication (NFC) allows users to pay for their items without opening an app or waking their display. Users simply hold their iPhone near a contactless reader and tap to pay. The phone then sends a subtle vibration and beep to let users know the transaction is complete. Coin is a similar product that also allows users to upload all their bank and loyalty cards onto one device and requires them to hold down a discreet button before swiping the card like any ordinary credit card. Coin raised $15.5 million in Series A funding through a crowdfunding campaign but recently made the news after delaying their launch until 2015, leading many to cancel their pre-orders. Plastc’s security chip sets it apart from its competitors. The ability to be recharged, along with superior fraud prevention technology, makes Plastc more preferable than Coin. The Coin device is not rechargeable and a new one must be purchased when it dies. Coin is also plagued by security issues. Although Plastc does not currently have a fully functioning prototype, buyers can find comfort in its co-founders’ track record. The card is currently available to pre-order for $155 and will begin shipping in Summer 2015.